Despite its location in Theatreland in the West End, Bedford & Strand has managed to defy the odds by maintaining a reputation as a local, rather than a touristy favourite, with a bar clientele that is typically suited up. It’s almost hidden away, with a nondescript entrance which leads downstairs to a bar and restaurant. On most nights of the week it’s busy, abuzz with conversation and an atmospheric hum akin to a Parisian bistro setting. Having been there several times before for drinks, I was curious to explore whether the constant stream of packed tables concealed a well-heeled eating spot in the heart of Covent Garden. To be honest, I didn’t actually use the word “hell”. I threw that in for dramatic effect for the purpose of your reading pleasure. But I do not think the tone of my voice could have been mistaken, even if I didn’t utter the word itself. As a consequence, there was no retort, just a mere nod of the head from the waiter and an offer of an exchange. Most of the foie gras terrines that I have ever eaten, and there have been many, have come in slices covering a surface area of several centimetres, and typically have been at least one centimetre thick. 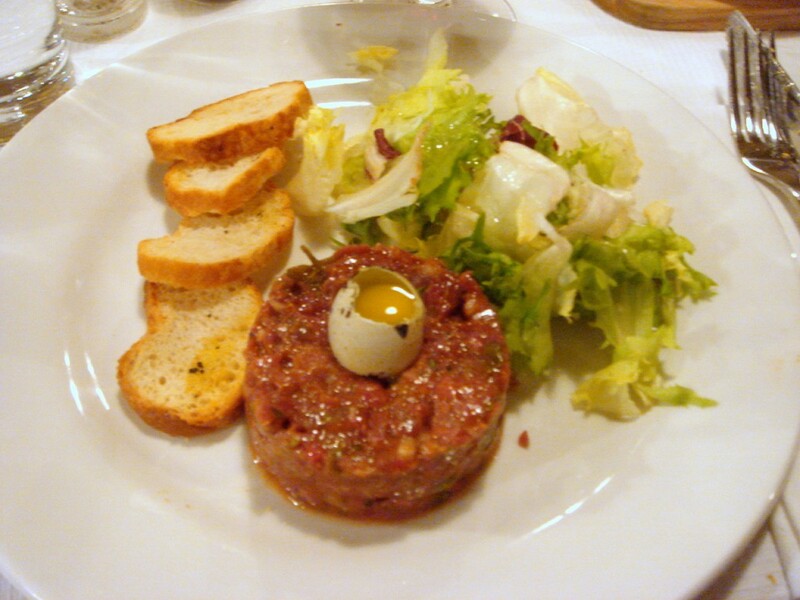 But it wasn’t so much the round shape of this piece of terrine as the portion size itself that bothered me. Roughly the size of a large thimble, it was so small that I was simply horrified. £9.50 for this? Who said size doesn’t matter? To be truthful, it generally doesn’t, but when it’s bordering on the ridiculous, there comes a point when you must just say ‘no way’. I quickly switched to an alternative starter of steak tartare, quail’s egg and melba toasts (£9.50), and this time around the serving was much more acceptable. However, it was unfortunately overwhelmed by the addition of too much Worcestershire sauce. Extremely tart, after several mouthfuls it became a little difficult to eat. A second starter of salt and pepper baby squid (£6.50) was tender, if a bit too peppery. The batter coating was also uneven, which had the effect of leaving some of the flesh exposed. A main of slow-braised Scottish ox cheek was delightful (£13.50). 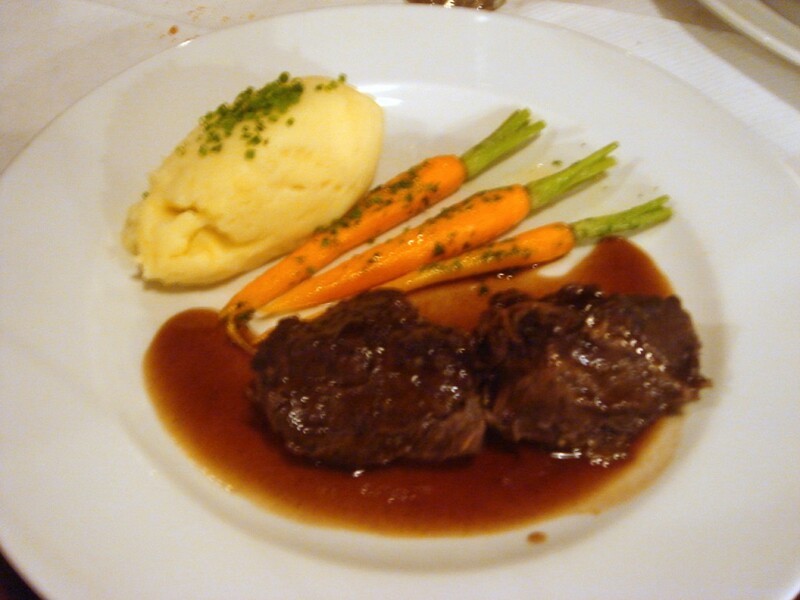 Tender and flavourful, it came with a lovely, creamy mashed potato, and sweetly caramelised carrots. A stilton risotto with William pear (£11.50) was pleasant, but a little heavy on the cheese. 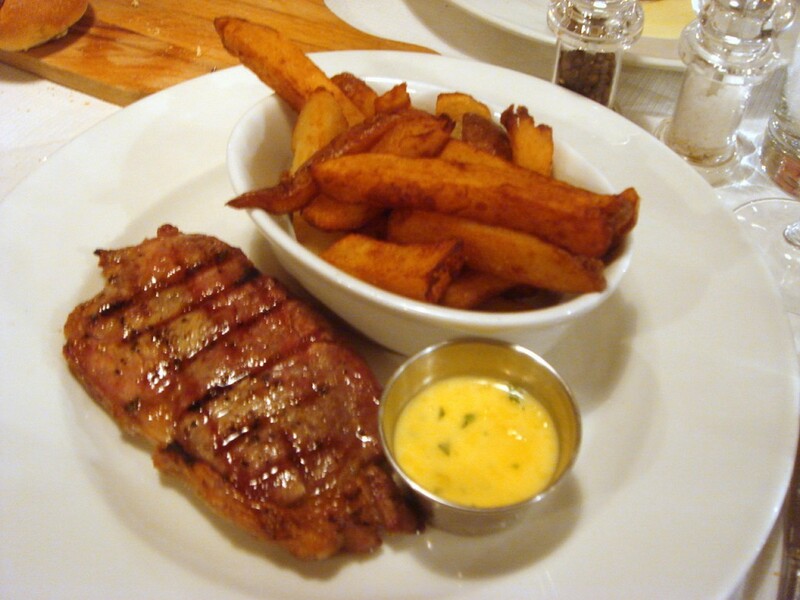 A 21 day Scottish rib-eye steak was served medium, rather than the requested medium rare, and was disappointing, for it was not the best cut of meat. Although it was not chewy, it was not as tender as it should have been for a steak that was priced at £18.75. Furthermore, it had not been sufficiently seared to provide the slightly crispy, brown outer layer which gives steak that additional flavour. The accompanying side of hand cut chips were also soggy and brown in colour, suggesting that they had been fried in dirty oil. 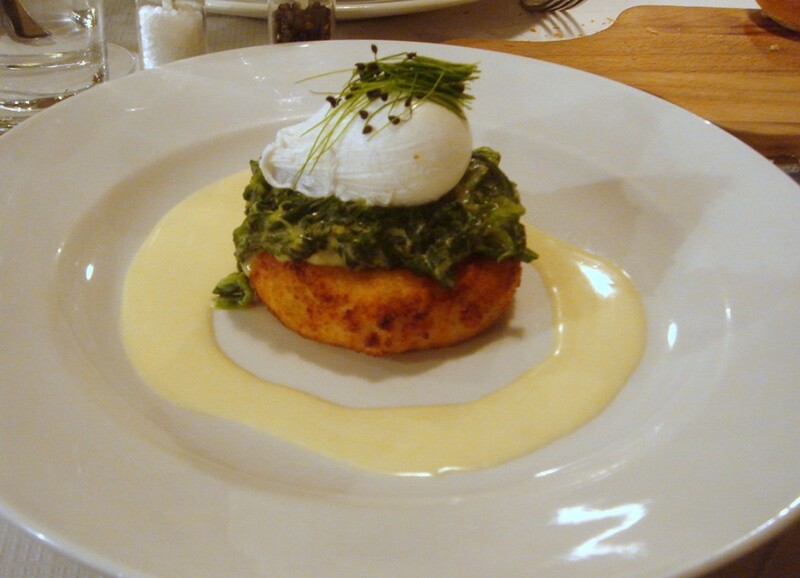 A salmon and haddock fish cake served with creamed spinach and a poached egg was not fresh, and its crumbed coating was soft rather than crispy, which suggested it had been pre-cooked and then reheated. 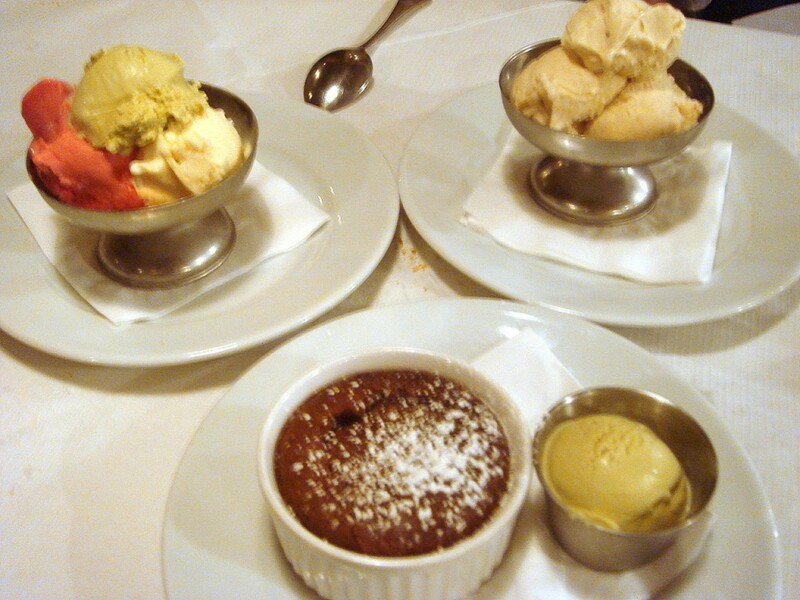 Dessert of a chocolate fondant with pistachio ice cream (£5.50), was creamy and chocolately, and ice cream (three scoops for £4.50) was satisfactory. Bread is worthy of mention, if for no other reason than its tastelessness. Hoping for freshly baked baguettes or the like, we instead received something that might have been purchased from the frozen section in the supermarket and defrosted. At this juncture, I might also mention the toilets. Typically this is not something I would blog about, but there was a rather unpleasant damp smell (as in damp and not sinister odours) permeating the facilities, which was probably not helped by the fact that the restaurant is situated in a basement. The service was as mixed as the food. We were predominantly served by two waiters, one of whom was extremely pleasant. However, the same could not be said of our other waiter who was initially very grumpy. After taking our order, he skipped off without giving us a chance to order drinks or sides. This caused some consternation, for what were we to do without drinks, particularly alcohol? To be fair, he seemed to mellow as the evening wore on, and I can only wonder if this was a silent (and guilty) acknowledgement that the restaurant might have tried to serve me a raw deal with the foie gras terrine. At best the food is average, and at the prices they were charging, the experience did not feel worthwhile. Therefore, I am sad to say that there is no hidden Covent Garden gem here. Still it was a night for many firsts: the first time I was to sprint out of my chair in protest at my starter; and the first time I was to write about something that I did not eat. Price range – £24 to £35 for three courses. Excludes drinks and service. Sadly I think Covent Garden is a bit of a culinary wasteland and your experience has proved the point! Hi Gourmet Chick, I agree that there are a lot of culinary no-gos in Covent Garden. But there are some good places too, eg, Terroirs, which I think is great. Rules is good too, a stalwart of a British restaurant. And J Sheekeys and Wahaca aren’t bad either. Oh dear, what a disaster! That terrine is indeed a complete joke, and the way they replaced it without a word suggests it’s happened before. 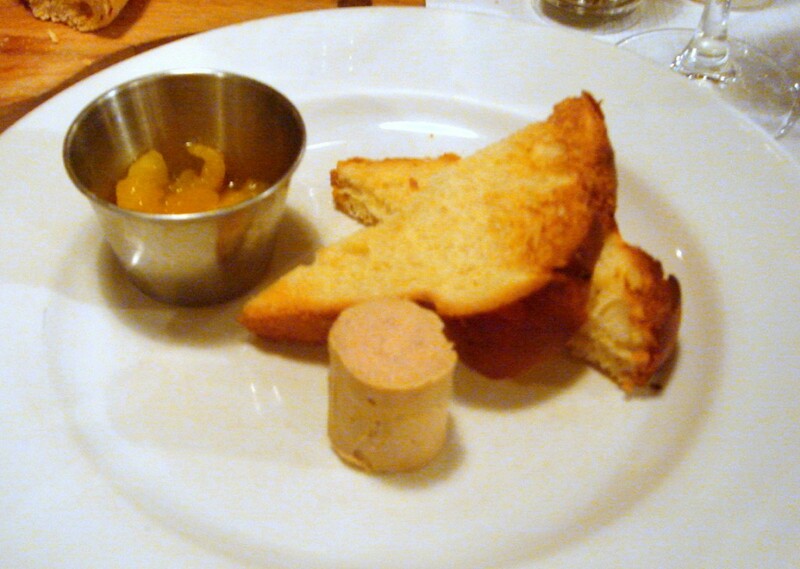 I can’t beleive they tried to charge 9.50 for the foie gras, it’s miniscule! Natasha, Oliver and Sam. Yes it was miniscule! That’s why I made a complete and utter fool of myself and jumped out of my chair in protest. I think we are all in agreement here that the foie gras was just not on. Oliver, yes you’re probably right. But if it’s happened before, then they should know better I think. I just discovered you blog and enjoy reading it…I love food!!! Your blog looks very professional, well done. But I really have to comment on your behaviour in the restaurant – what?? Sorry, but what makes you think you have the right to verbally attack the *waiter* like that? Just how exactly was it his fault? I admit that looked like only a small amount of foie gras, but then it is expensive stuff. I’d personlly never order it, but I think you have to expect it will vary in serving size and price being one of those typical ‘luxury items’. Having worked as a waitress, I can say that had someone been so rude to me I would have moaned to all the other staff about it, we would have done impressions of you and most likely made nasty comments behind your back about your choice of food/appearance/table manners. That’s just how it is – treat your waiting staff with some respect. Obviously if someone complained to me in a calm, clear and courteous manner I would be more than happy to oblige them. Thank you for coming to visit my blog and for leaving a comment. I would like to explain that I never attacked the waiter, and I never would to such a thing. The way I try and approach my writing is to be sometimes slightly tongue in cheek and sometimes in jest, so please do not take the comments about the foie gras in the wrong way. All I was trying to say about the foie gras was that it was small. I’m sorry if you took it any other way. I would never be rude to wait staff. My childhood was spent in my parents’ restaurant. I helped out with everything, including front of house, and I know how hard it is to work in one.